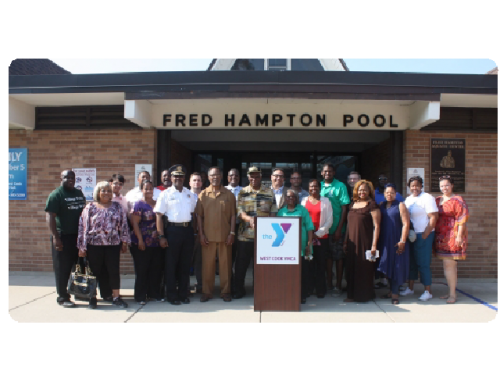 The Fred Hampton Pool is located at 300 Oak St. in Maywood. Passes go on sale in May! To inquire about refunds, please contact Kyle Albright, Associate Aquatics Director at kalbright@westcookymca.org. If the facility is closed due to mechanical reasons, refunds will be issued based on the length of the closure. Daily Fees and Annual Passes are included in West Cook YMCA Memberships. The Fred Hampton Aquatic Center has party packages available for parties, family reunions, school or church groups, or day care centers. Please contact the West Cook YMCA for information on how to book. All packages must be booked a minimum of 14 days in advance and are subject to availability. **Minimum enrollment numbers must be met for lessons to run. There will be no make ups for FHAC Lessons. Water Movement: Encourages forward in water and basic self-rescue skills performed independently. Water Stamina: Develops intermediate self-rescue skills performed at longer distances than in previous stages. Register for Swim Lessons in person at the Fred Hampton Aquatic Center. Gold Sponsors: Forest Park National Bank & Trust Forest Printing Klein, Thorpe & Jenkins, Inc.
Silver Sponsors: AA Rental a5Group Inc. Your investment creates positive change. • Contribute as a Monetary Sponsor and directly offset operational costs. • Contribute as a Scholarship Provider and not only will you directly offset operational costs, but you’ll also receive Scholarship Annual Passes to give to youth or families who cannot afford passes. We’re meeting a need in our community. We are making a difference. 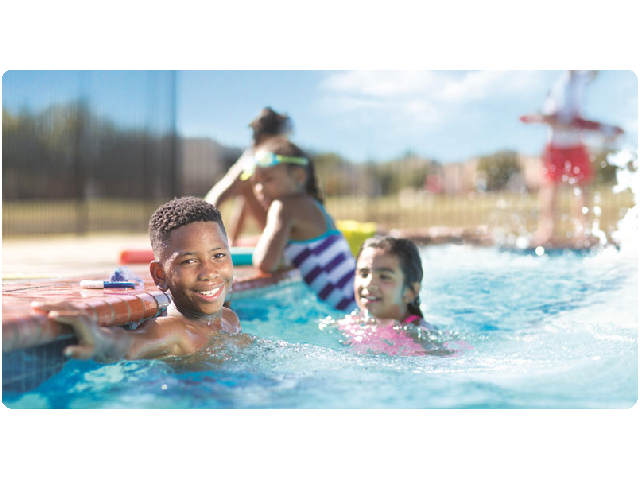 • 100% of the 758 children and adults who received complimentary swim lessons reduced their risk of drowning by learning safety in and around water. We have a big dream for 2019. Our goal this summer is 11,000 guest visits. We want to provide at least 260 children with swim lessons. Statistics show that minority children have a high rate of drowning. We want to help lower that rate by teaching children proper water safety skills. Studies have shown that physical activity leads to higher achievement in the classroom. We want to support the youth of Maywood and help them reach their full academic potential. Studies have also shown that children who spend more time outdoors are less likely to be obese. We want to support a healthier community by giving children the opportunity to spend summer outdoors! Your investment creates positive change. Contribute as a Monetary Sponsor and directly offset operational costs. Contribute as a Scholarship Provider and not only will you directly offset operational costs, but you’ll also receive Scholarship Annual Passes to give to youth or families who cannot afford passes. Contribute as a Monetary Sponsor and directly offset operational costs. Contribute as a Scholarship Provider and not only will you directly offset operational costs, but you’ll also receive Scholarship Annual Passes to give to youth or families who cannot afford passes. Together, we can ensure kids have a fun and safe summer.